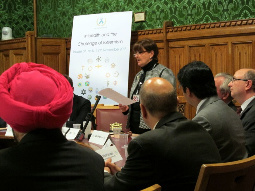 The All Faiths Network for the United Kingdom reaches into some twenty-five different belief and faith traditions. It is a registered charity (No. 1145611). The All Faiths Network is open to people of every faith and belief recognised in law (such as under the Equality Act 2010) without discrimination. The Network was formally established on 30 August 2011, but has actually been in active operation since 1 December 2010. We are registered with the Charity Commission as an incorporated body with charitable objects: to promote religious harmony for the public benefit, and to work for positive, inclusive dialogue. All our member faiths are firmly committed to the principle of religious equality under the one law of the United Kingdom. We currently include members of about twenty-five beliefs and faiths, the largest coalition of different faiths in Britain, and actively invite membership from others.